Sometimes a movie comes along that completely shakes our world to the very core. It is a rare thing to experience this and when it does happen it is not easily accomplished a second time. 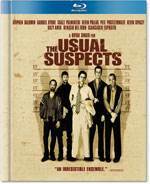 When The Usual Suspects came to theaters no one had any idea what to expect from it. Outwardly it looked like a simple crime caper but beneath that surface there was so much more and when the film finally reached its conclusion no one was prepared for it. "Who is Keyser Soze?" That was the question at the heart of this well executed and well told crime drama. It all begins with an explosion at a San Pedro shipyard, when police and customs agents investigate they discover 27 dead bodies, $91 million and two injured men; a badly burned Hungarian and Verbal Kint (Kevin Spacey) a crippled con-man. Verbal is brought in for questioning and finds himself in the office of U.S. customs agent Dave Kujan (Chazz Palminteri). After some brief routine questioning Verbal recounts the story of how he found himself on that boat amidst all that destruction. The story jumps back six weeks earlier when five criminals are brought in for questioning about a truck hijacking. These men are the "usual suspects" when it comes to these types of crimes. The cops know they were involved but have no way of proving it. The least happy about this is Dean Keaton (Gabriel Byrne), a former cop hoping to finally end this life of crime and go straight. While waiting for their lawyers to post bail Keaton is approached about doing one final job with the other four. The thought of a large payday is too hard to ignore and so Keaton agrees to the job. What none of them realize is that by agreeing to this job they have accepted to work for one of the most deadly criminal masterminds that has ever lived; Keyser Soze. As more details of their impending job come to light each man discovers that at some point each one of them has wronged Keyser Soze and now must finish this job if they wish to consider their debt to him paid. The crux of it is, no one has ever seen Keyser Soze, over the years his name has become a ghost story that criminals tell their children. But now it seems as though these four men are truly working for this cold blooded genius and there is little they can do to stop it. As Verbal continues with his story the identity of Keyser Soze becomes an important part of the investigation. It is clear that by deducing who he really is, they can close the door on this whole mess and go home peacefully. But as anyone who has ever been in over their heads, life rarely allows us to walk away unmarked and so the most important question of all becomes the theme for this beautifully told film: Who is Keyser Soze? To say that the performances in this film are extraordinary is an understatement. Everyone from Spacey down to Stephen Baldwin does a great job with their characters bringing depth, drama and turmoil to each. The thanks go to the director of this epic saga, Bryan Singer who, with one film, carved a name for himself forever in the streets of Hollywood. This wonderful tale finally arrives on Blue-ray and while it no doubt looks fantastic it surprisingly does not come with any extras. The only thing it does come with is a small booklet with an introduction discussing the impact the film has had on audiences as well as why it had the impact that it did there are also short bio's on each of the actors and their film history, a brief bio on Bryan Singer with some unique trivia surrounding the movie and finally a few snap shots of key moments in the film. For the die-hard fan this is a good treat because it gives you another take on what is obviously a classic film. The Usual Suspects is a phenomenal film that even now, 16 years later, has the same impact it did as when it came out. Download The Usual Suspects Digibook from the iTunes Store in Digial HD. For more information about The Usual Suspects visit the FlickDirect Movie Database.